Enjoy driving? Head to Wales – HubNut – celebrating the average! Things have been quiet on here lately, because I’ve been having a holiday type thing. After a week in France, we spent another six days in Sussex with more kindly family folk. For two entire days, I didn’t drive anywhere at all. The horror of the drive up from the ferry port at Newhaven was still large in my mind. Roads that congested are just no fun at all. Stupidly, I then decided to go and have a nose around Brighton. I don’t recommend this. Endless jams eventually overcame my desire to see the sea and I bolted for it. I was planning to head back to base when I was contacted by the man behind Fu’gutty Cars. 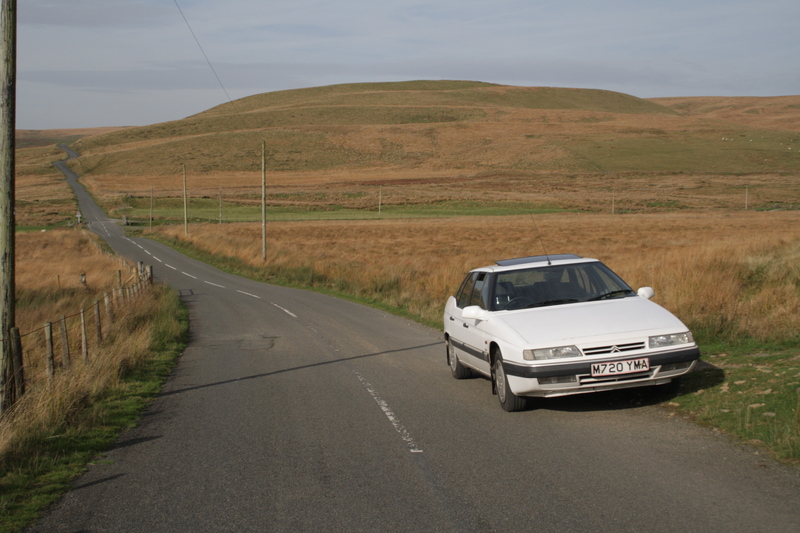 I won’t go into too much detail, as it’s his story to tell, but it involved spending an afternoon tinkering with an elderly Citroen to try and ensure it could make it 500 miles back to Scotland. Citroen barges, both with a long way to go. It was a nice way to spend an afternoon, and I got to have a drive in a CX again. Always an incredible experience. I was glad I hadn’t forgotten how to drive one. They really are like nothing else. After a couple more family-filled days, it was actually time to head back to Wales. It was a Sunday and we’d hoped to get the jump on the worst of the traffic. I was amazed at how busy the roads were though, and things got very slow at the meeting of the M23 and M25, where queue-jumpers conspired to balls things up for everyone else. Idiots. The M25 itself wasn’t too bad apart from the people who still have no idea about lane discipline. Idiots. I mean, how hard is it to keep left unless overtaking? And what was the point of constructing five lanes if people will only use three of them? As luck would have it, we nipped off at the M4 junction just before everything ground to a halt. Phew. Things got better from there as traffic levels continued to drop. Getting away from the frenetic madness of the South East is always a pleasure. In fact, we reached Crickhowell in just under three hours, which means our average speed since leaving Sussex was 67mph! Amazing. That was cruising at an indicated 75-80mph too, so hovering around the speed limit once you factor in the built-in speedometer error. The XM felt fabulous at cruising speed too. It’s remarkably refined. From Crickhowell, things naturally slowed down a lot. No more motorway – in fact, not even so much as a dual-carriageway for the next 58 miles. There was even single-track roads as we headed over the stunningly beautiful Elan Valley Mountain Road. The Elan Valley – wonderful driving terrain. What amazed here was how the XM was incredible fun to drive. It manages to be a comfortable barge that remains tight and entertaining in the bends. It doesn’t wallow and just grips. Furthermore, because the engine has so much torque, you find yourself driving very quickly in a very relaxing manner.Despite a boot full of shoes, bass guitar, ukuleles, bass amp, a large crockery plate, beer, wine, tools and spares (suitcases relegated to the back seat), it hurled itself over the undulating terrain with delicious composure. 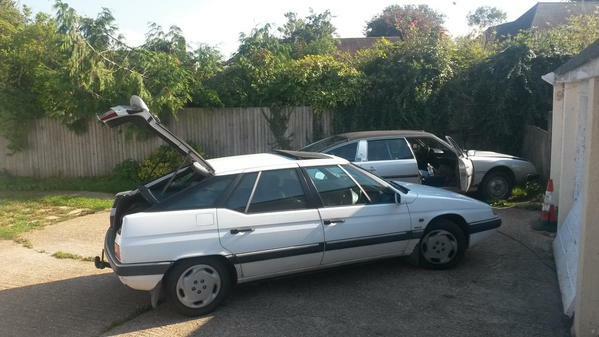 Perhaps not quite as fluid and controlled as a 2CV, but hey, no car is perfect. Sure, the XM has its (minor) faults, but it really is very, very good at the things I want it to be good at. It must be. I’ve now covered nearly 11,000 miles in it and am a few weeks away from one entire year of ownership. After that enjoyable adventure, perhaps it’ll be here for even longer yet. God, I miss mine even though it was an auto. I have had cause to drive the M25 on a couple of occasions this summer and not being a cockernee, I was amazed at how difficult people were finding it to keep left except when overtaking. I have a theory that some of this may be due to a fear of junctions: perhaps because drivers are worried they may get filtered off the motorway, but more probably because thay are frightened of drivers approaching them at high speed from the left as they join the road. I suspect there are also drivers who find the whole idea of lane changing intimidating and dangerous, so they are happy to travel mile after mile in their own little bubble allowing others to get on with it if they want to. I too love my XM! Absolutely! There is general mayhem around junctions, with people swerving on and off the motorway at high speed, often at the last minute – and woe betide anyone who isn’t sure which lane to be in. There’s no mercy. I have noticed a relatively new, to me, motorway style of driving which is to remain in the righthand lane and never move out of it even when all the other lanes have no or very few vehicles. The people driving like this are usually, but not always, driving at quite high speeds. Recently the police around here caught a driver travelling at “the highest ever speed” All I can say is the police haven’t been trying very hard, I see people travelling at 130 plus quite regularly, they did manage to catch a guy in a 1 litre Micra doing 100mph! In my younger, naughtier days, I once allegedly hit an indicated 100mph in a Daewoo Matiz on the M40. The silliness of youth. I was in the correct lane though. And to think I remember a time when you told me an XM was just a bigger BX and you didn’t see the need or desire for a bigger version of the BX. As someone who had a BX and XM on the drive at the time, I knew better … The XM is not just bigger, it’s a whole lot ‘better’. And it is fantastic on the twisties. Next car – get a Merc E class – ignore the horror stories of expensive bills, and the other tales of woe you get from people who don’t own one (sounds familiar to a Citroen XM owner, all these stories) – and just buy one. Get an estate and you even get the advantage of hydropneumatic suspension on the rear axle.